Bel Air (or Bel-Air)[fn 1] is a neighborhood on the Westside of Los Angeles, California, in the foothills of the Santa Monica Mountains. Founded in 1923, it is the home of The Hannah Carter Japanese Garden and the American Jewish University. The 4.1% of families headed by single parents was considered low for city and county neighborhoods. The percentages of married people in Bel Air were among the county's highest—66.0% for men and 65.7% for women. There were 808 veterans, or 12.9% of the population. 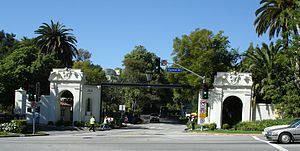 Of several entrances, there are two main ones: (1) the East Gate at Beverly Glen and Sunset Boulevards and (2) the West Gate at Bellagio Way and Sunset Boulevard, opposite an entrance to UCLA. Bel Air is generally subdivided into three distinct neighborhoods: East Gate Old Bel Air, West Gate Bel Air, and Upper Bel Air. Bel Air Estates, the original subdivision of the Bel Air community, is generally bounded by Nimes Road to the north, Sunset Boulevard to the south, Beverly Glen Boulevard to the east and both sides of Bel Air Road to the west. The Hannah Carter Japanese Garden is located in Bel Air. It was inspired by the gardens of Kyoto. Many structures in the garden—the main gate, garden house, bridges, and shrine—were built in Japan and reassembled here. Antique stone carvings, water basins and lanterns, as well as the five-tiered pagoda, and key symbolic rocks are also from Japan. Television shows and films have been filmed in Bel Air, or are said to take place in the community. Exterior shots for the Beverly Hillbillies were shot in and around 750 Bel Air Road, built by Lynn Atkinson (and later sold to hotelier Arnold Kirkeby after Atkinson's wife refused to move into a house she thought too ostentatious). After the exterior shooting was completed, the residents of that address forbade any more filming, as passers-by would wander onto the property and ask to see 'Granny'. Exterior scenes from films such as Get Shorty have also been filmed in the area. Several episodes of the television show The Rockford Files were filmed in Bel Air. The television sitcom The Fresh Prince of Bel-Air was set in the neighborhood, although the exterior shots used were filmed in nearby Brentwood. The Bel Air Film Festival, first held in 2008, is an annual international film festival held in Bel Air and the Los Angeles area. The Los Angeles County Department of Health Services SPA 5 West Area Health Office serves Bel Air. It lies within the 5th city council district, represented by Paul Koretz. It is located in the 90077 (Bel Air Estates & Beverly Glen) ZIP code, which is part of the city of Los Angeles. 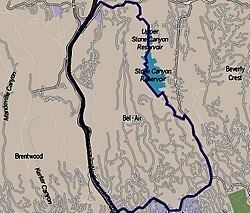 Stone Canyon Reservoir lies in the northeastern part of Bel Air. Established in 1994, it serves around 500,000 people. The Bel Air Association has been operational since 1942, dedicated to preserving the aesthetic appearance of the residential community. The Bel Air Association is located at the entrance of the East Gate of Bel Air at 100 Bel Air Road. Los Angeles Fire Department Station 71 is in the area. The Los Angeles Police Department operates the West Los Angeles Community Police Station at 1663 Butler Avenue, 90025, serving the neighborhood. Almost two-thirds (66.1%) of Bel Air residents aged 25 and older had earned a four-year degree by 2000, a high percentage for the city and the county. The percentages of residents in that age range with a bachelor's degree or greater were high for the county. The community is within the Los Angeles Unified School District. The area is within Board District 4. As of 2009, Steve Zimmer represented the district. Community Magnet Charter Elementary School, 11301 Bellagio Road. As of 2010[update] because the school's point-based admissions system does not favor area residents, children living in Bel Air generally do not attend the school. It is located in the former Bellagio Road School campus. Roscomare Road and Warner Avenue Elementary School in Westwood are the zoned elementary schools serving Bel Air. Bel Air is within the attendance boundaries of Emerson Middle School in Westwood and University High School, West Los Angeles. In April 1983 an advisory committee of the LAUSD recommended closing eight LAUSD schools, including Bellagio Road School. The committee did not target Fairburn Avenue School in Westwood, as a way of allowing it to preserve its ethnic balance, and so it can take children from Bellagio Road in the event that it closed. In August 1983 the board publicly considered closing Bellagio, which had 240 students at the time. The school's enrollment had been decreasing. In May 1983 the board voted to keep the school open. In February 1984, after the composition of the board had changed, the board voted to close the Bellagio Road School. Bel Air previously housed the Bellagio Road Newcomer School, a 3rd–8th grade school for newly arrived immigrants. In 2002 it had 390 students from Armenia, China, El Salvador, Guatemala, Korea, Russia, and other countries. This program was housed in the former Bellagio Road school. Westland School, 16200 Mulholland Drive, was founded in 1949. It moved to its current location in 1965, becoming the first school to locate in what has now developed into a major 'institutional corridor' in the area of the Sepulveda Pass. Bel Air is home to the American Jewish University. ^ West Los Angeles Realty and the Los Angeles Times use Bel-Air while the Thomas Guide for[clarify] uses Bel Air Estates. ^ "Homes for Sale – Bel Air, CA". West Los Angeles Realty. Retrieved September 12, 2017. ^ "Bel Air". Los Angeles Times. Retrieved September 12, 2017. ^ Thomas Guide: Los Angeles County Street Guide & Directory. Thomas Brothers. 2002. p. xvi. ISBN 978-1-58174-339-5. ^ a b c d e "Bel-Air". Mapping L.A. Los Angeles Times. Retrieved October 31, 2015. ^ "Veterans Ranking". 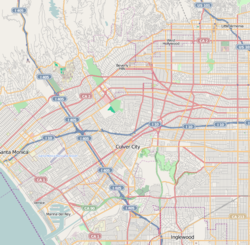 Mapping L.A. Los Angeles Times. Retrieved October 31, 2015. ^ "Diversity". Mapping L.A. Los Angeles Times. Retrieved October 31, 2015. The diversity index measures the probability that any two residents, chosen at random, would be of different ethnicities. If all residents are of the same ethnic group it's zero. If half are from one group and half from another it's .50." ^ Thompson, Daniella (April 18, 2007). "Mark Daniels excelled in developing and marketing scenic beauty". Berkeley Architectural Heritage Association. ^ "History of Bel-Air". Bel-Air Association. Archived from the original on February 23, 2014. Retrieved November 14, 2013. ^ Haddad, Annette (July 7, 2007). "No housing slump for super-rich – sales and prices have never been better in the Platinum Triangle". Los Angeles Times. ^ "Driving Directions from Los Angeles, CA to Bel Air, CA". Mapquest.com. Retrieved January 14, 2013. ^ Melton, Mary (August 25, 1996). "The Stars of Star Maps". Los Angeles Times. Each map tends to cover the 'three Bs': Brentwood, Bel-Air and Beverly Hills. A few toss in a Malibu sidebar. ^ Myers, David W. (May 28, 1993). "A Sad Westside Story : Home Prices Have Declined as Much as 50% Since the 1980s". Los Angeles Times. Retrieved July 4, 2014. But, as Meyer's case suggests, nowhere have those losses been as dramatic as the high-priced area on the Westside known as the 'three Bs' – Brentwood, Bel-Air and Beverly Hills. ^ "Climate Summary for Bel Air, California". Weatherbase.com. Retrieved September 12, 2017. ^ Groves, Martha (September 30, 2015). "UCLA and Hannah Carter heirs settle suit over Japanese garden in Bel-Air". Los Angeles Times. Retrieved April 17, 2016. ^ "Real Estate: TV Show Buildings At A Glance". TV Acres. Archived from the original on June 4, 2012. Retrieved January 14, 2013. ^ "Display of estate used in several episodes". Google Maps. ^ "Fresh Prince House – For Real This Time!". Iamnotastalker.com. May 22, 2008. Retrieved January 14, 2013. ^ Jones, Michael (October 21, 2008). "Bel Air gets a fest". Variety. Retrieved July 23, 2010. ^ "About Us". Los Angeles County Department of Health Services. Retrieved March 18, 2010. ^ "About us". Bel~Air Association. Archived from the original on April 9, 2010. ^ "Fire Station 71". Los Angeles Fire Department. Retrieved October 31, 2015. ^ "West LA Community Police Station". Los Angeles Police Department. Retrieved October 31, 2015. ^ "Board Members". Los Angeles Unified School District. Retrieved September 16, 2009. ^ "Bel-Air Schools". Mapping L.A. Los Angeles Times. Retrieved October 31, 2015. ^ a b Savage, David G. (April 11, 1982). "Many Minority Students Back in Their Old Schools". Los Angeles Times. Retrieved March 23, 2010. ...a bright and talkative black girl, rode a school bus from her home west of down-town Los Angeles to Roscomare Road Elementary School in the hills of Bel Air. ^ Guzman, Stephanie (August 15, 2010). "A Look Into L.A. Unified: Community Magnet". Neon Tommy (Annenberg Digital News). University of Southern California Annenberg School for Communication and Journalism. Retrieved January 15, 2012. ^ "Community School Proposed Relocation to Bellagio Road School Community Meeting" (PDF). Community Magnet School. July 8, 2002. Retrieved January 15, 2012. ^ a b Lesel, Helene (March 6, 2005). "A Part of the City, Yet Apart from it Too". Los Angeles Times. p. 2. Retrieved March 23, 2010. ^ Faris, Gerald (April 17, 1983). "Closing of 8 Schools Recommended, One Near Airport". Los Angeles Times. Retrieved January 16, 2012. ^ Pool, Bob (August 7, 1983). "Board to Consider Closing 4 More Valley Schools". Los Angeles Times. Retrieved January 16, 2012. ^ Savage, David G. (February 7, 1984). "L.A. Board to Close 5 More Schools". Los Angeles Times. Retrieved January 16, 2012. ^ Helfand, Duke; Hayasaki, Erika (April 26, 2002). "$459 Million in Cuts Are Considered for Fiscally Strapped L.A. Schools". Los Angeles Times. p. 2. Retrieved January 16, 2012. ^ Shuster, Beth (May 13, 1988). "Pilot Program Urged For 8 Elementary Schools". Los Angeles Daily News. Retrieved January 16, 2012. ^ "The John Thomas Dye School". Bel Air Association. ^ Woo, Elaine (November 22, 2000). "Where Bright Minds Can Shine". Los Angeles Times. ^ Markman, Jon D. (May 21, 1995). "Culture Shock Many Object to the Growing Sprawl of Institutions Atop Sepulveda Pass". Los Angeles Times. Retrieved October 19, 2013. ^ "Two Jewish educational institutes are merging". Los Angeles Times. March 22, 2007. ^ "Jennifer Aniston buys big digs in Bel Air". Real Estalker. Retrieved April 4, 2014. ^ Siler, Bob. "Homes of the Western Stars (A-B)". Charles Starrett – One Fan's Journey. Retrieved January 2, 2016. ^ a b NEAL J. LEITEREG, LAUREN BEALE and JACK FLEMMING (August 26, 2017). "Jay-Z and Beyoncé put down roots in L.A. with $88-million splash". Los Angeles Times. ^ "Former home of Wilt Chamberlain is up for sale". Berg Properties. March 9, 2007. ^ "John Gilbert, film actor, dies of heart attack". Reading Eagle. January 9, 1936. p. 13. Retrieved January 6, 2016 – via Google News. ^ "Local Inspiration for Movie Classics: Hitchcock had Link to Santa Cruz". Santa Cruz Public Libraries. Archived from the original on September 5, 2007. Retrieved March 4, 2008. ^ Crowe, Cameron (July 26, 1979). "Joni Mitchell Defends Herself". Rolling Stone. Retrieved September 12, 2017. ^ Musk, Justine (September 10, 2010). "'I Was a Starter Wife': Inside America's Messiest Divorce". Marie Claire. Retrieved September 24, 2011. ^ Heffernan, Virginia (February 27, 2015). "Leonard Nimoy, Spock of 'Star Trek', Dies at 83". The New York Times. Retrieved October 31, 2015. ^ Goldman, Leah (January 20, 2012). "Chris Paul Just Bought Avril Lavigne's $8.5 Million Mansion In Bel Air". Business Insider. Retrieved April 13, 2014. ^ Sanchez, Rene (June 6, 2004). "Presidential library, Bel Air streets become centers for grieving". Milwaukee Journal Sentinel. p. 13A. Retrieved January 16, 2012. ^ Mayer, Rus (March 2012). "TV Mogul Darren Star's Art-Filled Bel Air Home". Architectural Digest. ^ Brenoff, Ann (May 20, 2011). "Liz Taylor's Bel-Air Home Hits Market at $8.6 Million". AOL Real Estate. Retrieved January 14, 2013. Wikimedia Commons has media related to Bel Air. "Bel Air: A part of the city, yet apart from it too". Los Angeles Times. March 6, 2005.